Lughnasadh/Lammas festival celebrates the first harvest, that of grain. Two other harvests, that of fruit in September and meat in October, are included in the season of Lammas. 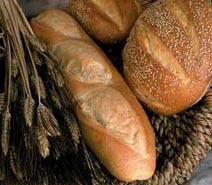 The word "Lammas" is a medieval Christian name which means "loaf-mass" because the loaves of bread made from the first grain were placed on the altar. The 'first harvest' is underway here in Switzerland. Farmers began reaping their grain last week. The straw is also being collected and baled,with a few extras for my mother-in-law to make wonderful stars and dolls. I can't share these craft ideas, 'cause I haven't learned them yet. I think weaving stars from straw is a kind of improv thing anyway. Today is Swiss National Day (like Independence Day) and already the 'bombs bursting in air.' I'm staying home. And in the little town of Wausau, Florida (about an hour's drive west of Tallahassee), today is celebrated as Possum Day. There is a festival in the park (where there is even a Possum Monument) honoring the contribution of this critter to the survival of soldiers during the Civil and Seminole Wars. Although it is an official holiday, it's really more like an every-family-in-town reunion. Big fun. Since August 1st is a day off in Switzerland, but August 2nd isn't, some local people (here in Seengen) started celebrating the night of July 31st. Quite a festival has grown up around it over the past few years, and last night we partied with about 1500 people. The population of Seengen is only 2500, so . . . . The fest is called "Tschou Tube" (pronounced like 'Joe Tuba'), which means "Goodbye Dove." I have no idea why. But as the sky began to lighten this morning, my husband pointed and showed me a cloud that looked just like a dove, which then dissipated--poignant. Up on a hill, between the woods, a corn field and a recently-harvested wheat field, there was a huge canopy with a bar and dj in the middle. On the near side was an area strung with colored lights and filled with rows of picnic tables. On one side of that were a couple of booths selling beer and food (chicken nuggets and mac salad--whoopee = P ) and on the other side one of those sledgehammer thingies like they have at the fair. You should have seen some of those beefy farmers, hitting it to the top 10 times in a row! I wanted to try it, but ended up dancing with the 'barker' instead. From this position on top of the hill, we had a spectacular moonrise. And although we missed Venus' rising, we saw her setting--WOW! Really, if you live near a hill, go up there about 3 or 4 a.m. and you will get a treat. Around 2 a.m., I finally made it around to the other side of the canopy. And what should I see but a huge bonfire. Oooooooh. I was there in a heartbeat. Aaaaaaah. It was encircled by 'burnable benches' (i.e. wood) and some people relaxing away from the crowd. I went to the far side sat down and gave thanks and praises. A young man joined me and we got into a wonderful conversation about (among other things) the old and the new, and how Switzerland superimposes its modern culture over the 'old ways.' He was amazed that I knew about the "Wild Man" and many other Swiss traditions. I was amazed with his stories about spending half a year in India and getting a different perspective. Then people began to throw their 'seats' onto the fire, and as it blazed even higher, they topped it off with dried evergreen branches. As the sparks shot heavenward, I broke into song. It was very cool. Not that I have any talent or anything. But I think I and others understood that singing was a natural reaction at that point. Then my husband showed up, and we watched Venus set. It was huge! By that time, we were (again) thinking about going home. We rode up with his brother, who was by then long gone, and we had passed on a few rides home already. When we returned from the bonfire, most of the people had already gone. We walked up to the path and tried hitch-hiking for about 5 minutes, then went back to the party with a second wind and danced our hineys off. I like to move it move it! And today I feel that God gives us what we need, like in the Tarot Aces, but he can't just drop it on our head, or we, or it, might be damaged. We have to at least stretch out our hand before we can receive. ***Excerpted from my original contributions to an online discussion graciously sponsored by Dracona Pagan Web.